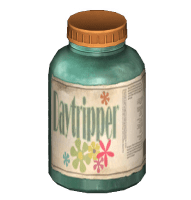 Day Tripper is a Chems consumable in Fallout 76 (FO76). Players may use this item to regenerate health, cure Addictions and Diseases, slow time, temporarily change the player's SPECIAL stats and add various other unique effects. Many Chems can be bought from medical supplies vending machines. It's possible to become addicted to some chems, which will result in decreased stats until the addiction is cured. "A pre-war chem favored by those looking for a "happy escape," Daytripper raises both Charisma and Luck, but lowers Strength, for a limited period of time." Day Tripper, a mellow hallucinogenic drug that was used as a way to escape the insanity of the mind. The effects provide the users with a calm, and soften mood - once it's taken, it also grants the user an increase of LCK +3, CHR +3, and a decrease of STR -2 for 10 minutes.